Should you look into the benefits of Reiki? Reiki ia a very popular alternative therapy that is also known as energy healing. It involves the use of universal energy, in particular the universal energy from the hands of the practitioner through to their customer. It first appeared in the 1800’s in Japan and is one of the many different forms of energy healing that have been used across the world for centuries. It works by enhancing and manipulating the natural energy fields that are around us all with the practitioner either hovering their hands over the person’s body or touching them lightly. You will find that some holistic practitioners will also employ the uses of Essential Oils during their reiki treatments as a way to use the senses fully and help to produce a calming environment for their customers. There are many Essential Oils that may be chosen including lavender, geranium and orange which are all known for their relaxing qualities. Theses oils compliment the reiki treatment as they can enhance the energy work to clear any blockages in the body. The blockages can be caused by an injury to a particular part of the body or through emotional stress and trauma. 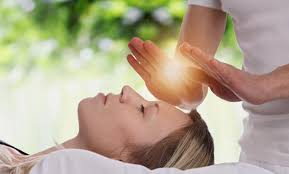 The word “Reiki” itself means “mysterious atmosphere” which is incredibly apt considering the whole practice centres around the energy fields that are around and within each of us. During a Reiki session you will either sit or lie in a comfortable position in a location that is peaceful and calm. In some cases their may be music playing and as mentioned above essential oils gentle diffused into the atmosphere. The practitioner will either place their hands on or just above various areas of the body and will leave these here for between two and five minutes depending on the result that you are looking for. In Reiki there are around 20 different areas of the body that the practitioner will work on with energy transfer. 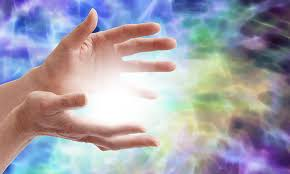 Practitioners note that during this time their hands will start to warm up and even tingle, once this feeling ends they know that the energy has been transferred to this area effectively. There are some practitioners that will also use the chakra system in order to help with energy transfer and increasing positive energy whilst reducing the negative energy that we can all pick up from the world and people around us. Many people who experience a Reiki session report an improvement in the way that they feel.